Las Vegas – The wait is over! 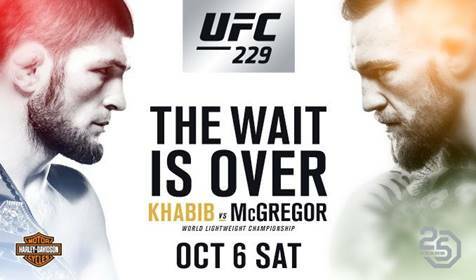 The biggest fight in mixed martial arts history is finally upon us as UFC® lightweight champion Khabib Nurmagomedov (26-0, fighting out of Dagestan, Russia) battles two-division UFC champion Conor McGregor (21-3, fighting out of Dublin, Ireland) in the main event of UFC® 229: KHABIB vs. McGREGOR on Saturday, October 6 at T-Mobile Arena in Las Vegas. The bout is the most anticipated in UFC history, pitting the undefeated Dagestani champion against the Pride of Ireland in a battle not just for UFC gold, but legacy as well.